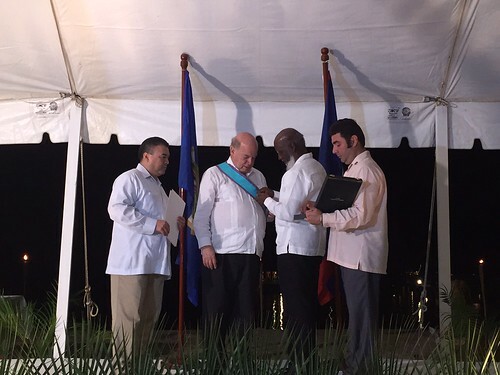 The Secretary General of the Organization of American States (OAS), José Miguel Insulza, received the Order of Distinction of Belize “in recognition of his diplomatic efforts and support in the advancement of the negotiation process between Belize and Guatemala." In presenting the award during the LIV Summit of Heads of State and Government of the Central American Integration System (SICA), held in Belmopan, the Minister of Foreign Affairs of Belize, Wilfred Elrington, recalled that the highest distinction is given to foreign citizens "who have performed an exceptional work for the government and people of Belize." He further explained that it represents a "recognition of the work and leadership of Secretary General Insulza, through whose good offices it has been possible to advance a positive relationship between the two countries, which has led to a series of agreements to enhance our confidence and advance the peaceful resolution and settle our dispute, which represents one of the most important events for Belize in the past six years." For his part, Secretary General Insulza thanked the Central American country for the award and recalled that since its creation, the OAS "has worked tirelessly for peace and the peaceful resolution of conflicts between nations, as reflected in our founding charter." In his speech, the leader of the multilateral Organization explained the process through which Belize and Guatemala have gone to reach their current friendly bilateral relationship, and how the OAS has contributed. "The stronger the links are between the countries, the easier it is to contribute to the stability of their relationship," he said, recalling that the OAS currently works with both states on issues such as education, environment and economic cooperation, among others, conversations "that will allow for a more authentic and strengthened relationship," he said.